The National Society of the Colonial Dames of America in the State of North Carolina, formerly called the North Carolina Society of the Colonial Dames, was the fourteenth state society added to the national organization founded in 1891. Membership is for women of lineal descent from residents of the American colonies before 1750 who rendered service to their country before 5 July 1776, including the signers of the Declaration of Independence. Forty states have these societies. 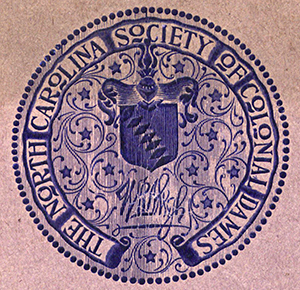 The North Carolina Society of the Colonial Dames was organized in 1894. Florence Wilson Hill Kidder was the founder and first president of the organization. The charter members were all residents of Wilmington. During the first decade of the twentieth century, other areas of North Carolina organized their own county or town committees of the North Carolina Society of Colonial Dames. Early on, marking historic sites became a primary goal of the statewide group. Under the leadership of Luola Murchison Sprunt, president from 1906 to 1912, the Colonial Dames compiled a list of 77 important sites in North Carolina, an early attempt to designate or register such places. Bronze tablets and granite markers commemorating important historical events began to appear throughout the state. Gabrielle Moore deRosset Waddell, a society officer for 39 years, served as president from 1916 to 1935. During her tenure, the society began to award medals, loans, grants, and scholarships to worthy students of North Carolina history. It also began to generously support the publication of scholarly books, essays, and research concerning the history of the state. A sampling of books that have been supported by the Colonial Dames include Journal of a Lady of Quality; Being the Narrative of a Journey from Scotland to the West Indies, North Carolina, and Portugal in the Years 1774 to 1776, by Janet Schaw (1921); a reprint of The Journal of Thomas Lawson-Gentleman (1936); The Early Architecture of North Carolina, by Thomas T. Waterman (1941); and The North Carolina Portrait Index, 1700-1860 (1963). The society has also been actively involved in the historic preservation movement in North Carolina, giving generously to various restoration projects. Colonial Dames have preserved four important early North Carolina buildings. The Joel Lane House, built ca. 1760 and located in Raleigh, was acquired by the Colonial Dames in 1926. The Fourth House, built in 1772 and located in Winston-Salem, was purchased for preservation by the Colonial Dames in 1935. In 1937 they acquired the Burgwin-Wright House in Wilmington for their state headquarters. Built around 1770, it is one of the finest examples of Georgian architecture in the state. Haywood Hall, built around 1799 and located in Raleigh, was inherited by the Colonial Dames in 1977. The society continues to support the preservation of these buildings and makes them open for public tours. Other activities of the Society of Colonial Dames include war relief efforts during both of the world wars; help for the needy during the Great Depression; assistance to the Red Cross; support of libraries, museums, and night schools; nursing scholarships for Native American women; scholarships and loans for gifted college students; and support of various social services. Members of the North Carolina society also support the activities of the National Society of the Colonial Dames, including the preservation of Dumbarton House, the national headquarters located in Washington, D.C.
Frances Sutherland Lee, A History of The National Society of the Colonial Dames of America in the State of North Carolina, 1961-1994 (1994). Wood, Jean Dalziel. "A history of the North Carolina Society of the Colonial Dames of America: from March 1894 to March 1935." S.l: s.n. 1935. Van Noppen, Charles L. "The supineness of the North Carolina historical association and the ignorance of the North Carolina Society of colonial dames." Greensboro, N.C. 1912. http://archive.org/details/supinenessofnort00vann (accessed November 28, 2012). [North Carolina Society of Colonial Dames logo]. Historical addresses delivered at the ruins of Saint Philip's Church under the auspices of the North Carolina Society of Colonial Dames. Wilmington, N.C.: The De Rosset Press. 1901. http://digital.lib.ecu.edu/17089 (accessed November 28, 2012).